Then creating the conditions, leadership or communications necessary to fulfill the vision. Click the tabs above for a few case studies which will give you an idea of my process. But the program was invested in its historical name, as were the clients. So the question became, how can TOP keep the brand they've established with their service population while making it clear to potential donors what the group was about? I suggested adding four words to be used with their name. This short tag line would do many things: (1) articulate the vision (2) make sense of the organization's historical name (3) explain what the program did (4) convey a sense of caring about clients while refusing frame the work as a people problem (as saying something like "helping the homeless every day" does, covertly). ​The Other Place. Until there's no homelessness. This case study shows something about my creative process and thinking, because writing, organizing and strategizing are creative processes and inform each other. ​A veterinary clinic wanted to reorganize its staff. Thinking traditionally and hierarchically didn't suit the clinic owner, who really wanted to promote sharing of responsibility and tasks among her staff, many of whom worked part time. I created an organizational flow I call "Circles of Influence" instead of thinking in terms of departments. The main circle is pictured below, then each individual area of influence has its own circle of related tasks (not pictured here). 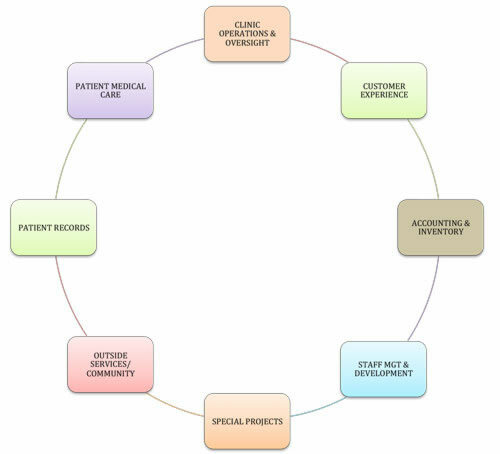 In the actual clinic plan, people are assigned within these circles — sometimes their name shows up in several different places as they are assigned according to their strengths. This allows the staff to flow to jobs and tasks that they are passionate about doing. A fair amount of time I'll have entrepreneurial clients who need a professional web presence and don't have web skills — but they want to self-manage their web content as a way of controlling ongoing costs. One of my skills is helping them identify what tasks they actually can do and want to do— and what they want to contract out. Based on this understanding, I design a site, HTML email or presentation on a platform that works for them and teach them how the technology works "under the hood." I've worked with many different platforms such as Wordpress, Squarespace, Wix, Silverpop, Mailchimp, Constant Contact... and of course PowerPoint and Prezi. One client's reaction when her website "went live:"
​"LOVE it!!! I'm so happy!! Thanks again for all your fantastic help. I really like the way it's turned out so far." — J.P. I'm an accomplished writer who has served large, national accounts—and solo entrepreneurs. I've worked in tech, medicine, education, the arts, and non-profits. With decades of comms and change experience, my skills are extensive. I write, design, and produce content in all media, thanks to stints as an agency copywriter, TV producer, and webmaster. I create, clarify, and lead change as a creative strategist, certified change manager, and accredited coach.